Craig McPhee joined the BSc Honours Veterinary Nursing Degree programme at Edinburgh Napier University (in collaboration with The College of Animal Welfare) in 2013. We caught up with Craig and asked him to share some of his experiences about his time at College. Why did you choose to undertake the programme you are studying? I am currently in my third year out of four of the BSc (Hons) in Veterinary Nursing. I chose to sit this course primarily due to my love of animals, I have wanted to work with animals in some shape or form from a young age. Through this, I gained work experience within a veterinary practice and it was through this insight into the inner workings of a veterinary practice that helped me to decide on Veterinary Nursing as a career path to follow. Which parts of the course do you like the most? I most enjoy going out on placement and also learning about the anatomy of a variety of animals. Learning about the anatomy of animals is not only a vital part of the basis of understanding the majority of the course, it also allows for a better understanding in more practical and hands on aspects of working with animals. Going on placement is, in my opinion, the best part of the course. It allows you to see firsthand exactly what happens behind the scenes in a veterinary practice and you get the opportunity to expand your learning and understanding while also gaining experience in the profession you are working towards. Which parts of the course do you find the most challenging? The course as a whole is very challenging and is by no means a walk in the park. However, that is something that I was made aware of right from the start and it adds to the sense of accomplishment when you progress from trimester to trimester, slowly progressing towards becoming qualified. If I had to chose one specific part of the course that I felt was the most challenging, it would be learning the pathology behind the diseases that affect different body systems within different species of animals. Why did you choose to study at The College of Animal Welfare/Edinburgh Napier University? 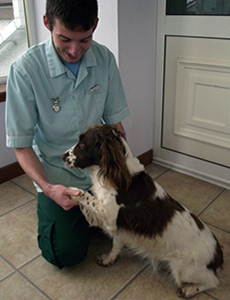 When choosing to study veterinary nursing, I had the choice to sit the diploma course at college or the degree course at university. I chose to sit the degree course as it is a more prestigious course, being mainly based in Edinburgh Napier University. Napier university is also linked with The College of Animal Welfare, which provide all the necessary equipment required to build on practical skills and experiences. The degree course also provides a vast variety of choices upon completion of the course, in terms of what career path you want to follow; meaning that although you qualify with a Veterinary Nursing degree, you are not directly limited to working solely as a Veterinary Nurse, there are other options. After I qualify as a Registered Veterinary Nurse, I plans to hopefully work in a veterinary practice for a couple of years to build up my experience and become more confident in my abilities. I then plan to travel the world, stopping off in different countries to work with more exotic and large animals. After taking time out to travel, I will hopefully return home to Scotland and get a job working to protect animals in a company that works to uphold animal welfare. What advice do you have for someone looking to do this course? If you are looking to do this course, I would say that it is a fantastic course and if you are someone that does not back down from a challenge then this is definitely worthwhile. It is not an easy course and unless you are fully committed to pursuing this as a career I would think quite hard before deciding on this degree. That being said, it is a very satisfying and the reward of being able to help an animal recover back to health and seeing them go home back to their owners completely outweighs any negatives associated with the course.